When it comes to travel accommodations, suites are basically the filet mignon of hotel rooms. Multiple bedrooms, stylish decor, and ample living space for you and your squad? Um, where do we sign up? Extra perks like a pool table or a fully-stocked bar? Why even leave the room? For most travelers, however, hotel suites might seem more suited for, say, Beyonce and her personal Beyhive. But the folks at Suiteness are out to prove that staying in a suite on your next trip can be both easy on the wallet and give you your own Pretty Woman moment. The booking site offers members exclusive access (and pricing) to luxury suites in popular destinations like Los Angeles, Miami, New York, and many other cities. 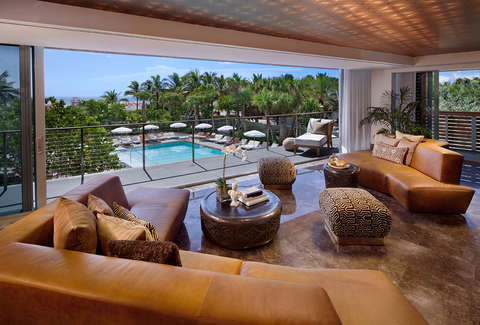 These are suites previously not available to reserve online -- accommodations with up to five bedrooms in top hotels like The Venetian Las Vegas, Fontainebleau Miami Beach, and more. So whether you’re looking for a comfortable and spacious place to stay for a bachelor or bachelorette party, family vacation, or romantic getaway, read on for how this site could be the travel “hack” your next trip needs. If you’re traveling with a big crew, having enough space is a must. There’s nothing worse at the end of a long day than having to crash on a couch or lumpy cot. (And you may love spending time with your friends and family, but try sharing one bathroom with them for a long weekend.) For groups, a two-bedroom (or larger) suite provides a shared living room to hang out in, dining area for meals, additional bathrooms (always a plus), plus all the amenities of hotel lodging. Enter the connected suite -- available exclusively on Suiteness. Unlike a regular two-bedroom suite, a connected two-bedroom suite combines a traditional one-bedroom suite with a room that attaches to it (a configuration present in most hotels) and -- here’s the key -- allows them to be booked together. “The best thing about connecting suites is it gives you all the space of a vacation rental, while you’re still at a hotel,” says Cherie Zhong, Suiteness’ lead concierge. You’ll also be saving money, as a connected suite is often half the price of a traditional two-bedroom suite -- a difference that could equal up to $1,000, according to the site. Savvy travelers know that planning ahead is a tried-and-true way to score the best deals and ensure you cross every item off your “must-do” list. So all you have to do is figure out what neighborhood to stay in, what restaurants require advance reservations, what attractions you need tickets for, (also, don’t forget to book your flight!) -- while dealing with work and all your other day-to-day stresses. Or… not. Since we can’t all be as organized as Leslie Knope, Suiteness offers a complimentary personal concierge to help with whatever you might be looking to do on vacation. And, unlike a traditional hotel concierge, you don’t need to wait until arrival to start using their services. “The concierge helps you from the second you land on the website to book a suite,” Zhong says. On a romantic getaway? That couple’s massage or candlelit dinner is just a virtual chat away. If you’re looking to score a VIP table at a club, tickets to a show, or anything else to make your night on the town one to remember, Suiteness also has hook-ups thanks to their partnerships with top restaurants and entertainment companies. For example, every suite booked on Suiteness at Nobu Vegas gets two free drinks, a dessert platter, and club passes. Besides extra space and comfort, staying in a suite also means access to the usual hotel perks -- housekeeping service, a bar within steps of your bed, a burger and fries delivered directly to your room. 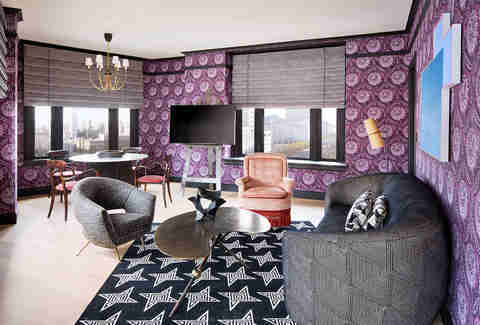 And opting for a hotel suite can also be advantageous should your temporary living conditions not prove up to snuff. In the case of a broken sink or drafty room, hotel staff can transfer you to another suite fairly quickly -- unlike a private property, which likely doesn’t have a second house to move you into. Plus, while rental hosts can sometimes be difficult to reach, the concierge team at Suiteness is available 24/7 -- they even text with customers. “Some people ask everything from ‘What’s the weather like?’ or ‘Can you make sure my room is facing a certain way?’” Zhong says. “We’re communicating with them all the time and we help them with everything.” It’s basically like having your own personal Geoffrey from The Fresh Prince of Bel-Air at your fingertips. Suiteness suggests booking at least 60 days out from your trip to get the best deal, and offers price matching protection for would-be procrastinators. “If the prices ever drop after your booking, we’ll go ahead and honor that new rate,” Zhong says. And if you’re traveling with friends or family, their Pay by Group option helps split up the bill when the trip is over. (No more deciphering what that emoji-filled Venmo request is actually for.) Sounds pretty sweet to us.